For a corporation with a national scope, branding is essential in creating a unified image easily recognized by the public. This was especially true for the newly formed National Railroad Passenger Corporation, established by an act of Congress in 1970 to operate the country’s intercity passenger rail system. One of the first steps taken by the young company was to create a more relatable, catchy nickname. Although “Railpax” was initially used, it was soon replaced by “Amtrak,” a blending of the words “American” and “track.” It was considered “a short, powerful name, easy to pronounce and remember, with high visual impact..."
Amtrak also chose a service mark and graphic identity defined by the patriotic colors of red, white and blue. This fresh visual identity would carry over into the effort to create new uniforms for the Onboard Service and Station Service personnel with whom passengers directly interacted. 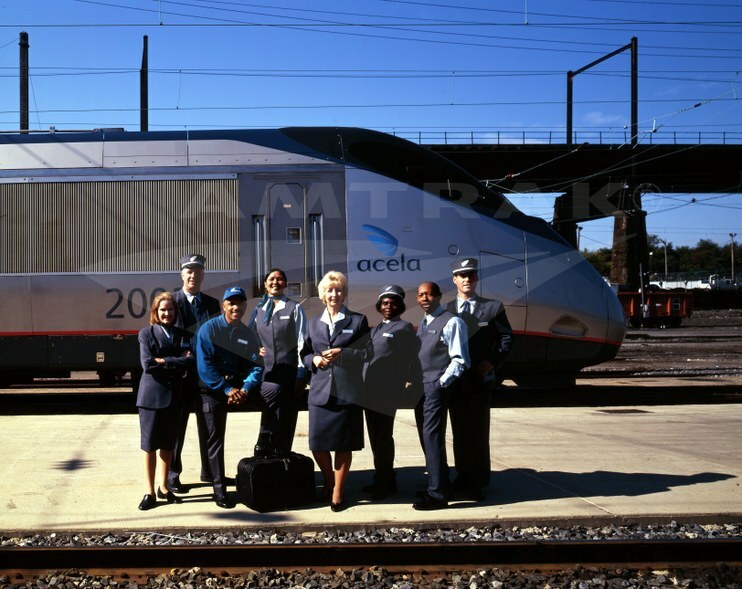 Over the next four decades, these uniforms reflected popular color and style trends, thereby ensuring Amtrak employees projected a polished, professional image. Atkinson developed conceptual sketches that were presented to teams of employees, union officials and Amtrak executives. The new uniforms were manufactured with a blend of wool or cotton with Dacron polyester, a popular and “fashionable” fabric in the early 1970s. 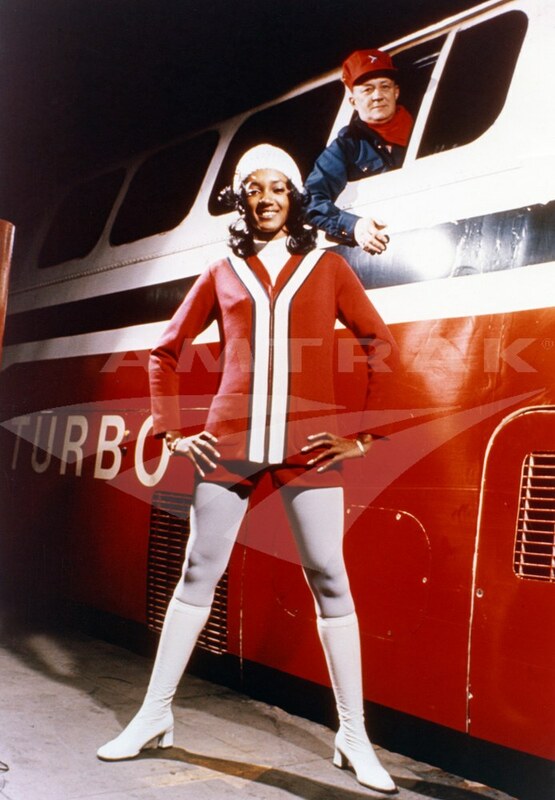 Components were intended to be “serviceable, functional and easy to care for.”2 Atkinson took advantage of bold reds and contrasting color combinations and cleverly incorporated the Amtrak service mark—an inverted arrow—into many pieces, including jacket cuffs and along the neckline of a sweater intended for female passenger service representatives. chevrons echoing Amtrak's first service mark. The conductor’s uniform remained traditional navy blue, but the Norfolk-cut jacket was finished with red saddle stitching. Conductors would also wear a western-style shirt with a red tie. A pouch resembling an attaché case provided room for the ticket punch, seat checks and other tools of the trade. In keeping with the relaxed, fun atmosphere of the onboard lounges, the bartender received one of the more colorful makeovers: a three button cuff bandana shirt and blue and white striped pants held up with tri-color suspenders. Female passenger service representatives, sometimes referred to as "train hostesses," were given the most options, with pieces such as hot pants and a floor length skirt that could be mixed with various tops and sweaters according to the season. Perhaps indicative of contemporary male attitudes towards the entry of an increasing number of women into the workforce, Atkinson commented: “In this era of unisex, distinctive uniforms for the Amtrak gals, from ticket seller to hostess, are absolutely feminine…We feel that just because a guy is riding a train doesn’t mean he’s lost interest in girlwatching.”5 While promotional photos depicted female employees happily wearing hot pants and go-go boots, some women considered this attire unprofessional and favored skirts and slacks. At the ticket desk, male ticket sellers wore striped blue and white pants with a gingham shirt, red double-breasted vest and tie. Female ticket sellers wore a blue shirtwaist dress with brass buttons and “nifty” red, white and blue Amtrak scarf. The look was complemented by blue pantyhose and blue shoes. Red Caps, who help passengers with baggage navigate through the stations, wore a jumpsuit topped off with a beret. 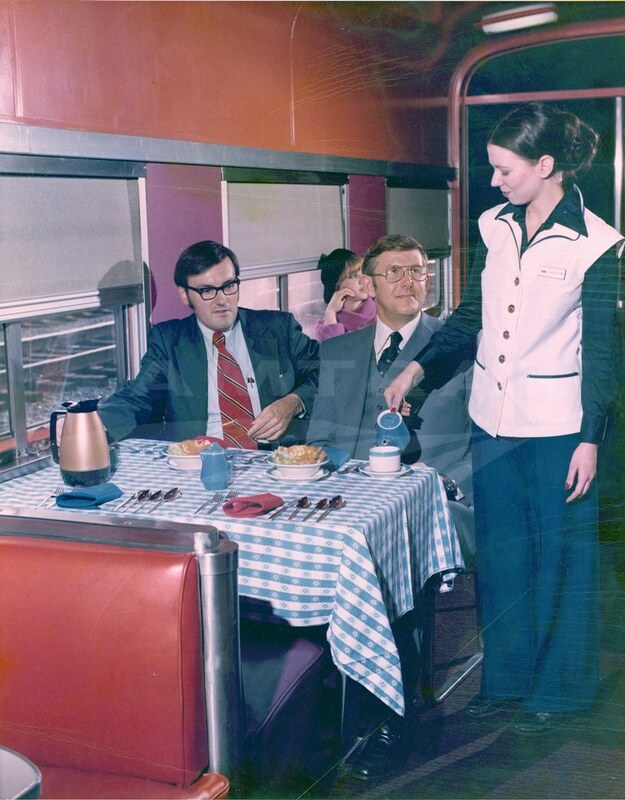 The first uniforms were in use until the late 1970s when updates were made in preparation for the arrival of the new bi-level Superliner cars. The new uniforms would “combine comfort and fashion and present a professional image to the public.” An article in Amtrak NEWS noted that Dining car stewards would be receiving new “Amtrak Blue” uniforms “designed to look and wear better than the old two-piece red suits they replace.” These polyester ensembles had tailored jackets with rounded collars and flared, cuff-less trousers. A sense of formality was retained by requiring stewards to wear a white vest with five logo buttons and blue trim at the pockets, as well as a blue necktie. Male attendants had found Atkinson’s white double-breasted jacket uncomfortable and too short, so it was changed to a longer, single-breasted style. Female attendants now wore navy blue slacks with a navy blue blouse or turtleneck pullover, as well as a white vest trimmed in blue to match the men’s jacket. As usual, the cost of the clothing was split between Amtrak and the employee. By April 1, 1978, Onboard Service personnel were wearing the new uniforms, although the arrival of the Superliners had been delayed by a year due to a strike at the manufacturing plant. red to calming navy blue and grey. Employees were encouraged to choose from a variety of “timeless accessories” such as cardigan and pullover sweaters “so you can put together a professional look that’s uniquely yours.” One major change, following employee input, was the addition of short-sleeve shirts and blouses for warmer months. Reflecting current trends, Onboard Service chiefs and stewards wore a single-breasted navy blazer whose “extended square shoulders, tapered body and two-button closures create a slim silhouette that accentuates an image of confidence.” Outfits were set off with straight or bow ties for men and ties for women; against a burgundy background, a pattern was created by alternating the Amtrak logo in grey and blue. Station personnel were to appear “efficient, yet at ease” in navy blue pants and vests; women also had the choice of a below-the-knee skirt. It was easy to identify station supervisors, since they wore grey pants with a navy blue jacket, as well as a tie. The jump suits and coveralls worn by Red Caps were replaced by pant and shirt combinations— epaulets also made their first appearance. First introduced on the Northeast Corridor, the uniforms were then supposed to be distributed nationwide. But this roll out never occurred; after a few years, Onboard and Station Services personnel determined that the old navy blue gabardine blend had been more comfortable and better retained its shape.9 It would take until 2006 to cycle through the existing stock of grey uniforms and fully transition back to the traditional navy blue. The only personnel not making a return to blue were the chefs and cooks who retained their traditional whites. An article in Amtrak Ink, the employee magazine, highlighted one new feature of all uniforms: “epaulet slides, which are color-coded to reflect the job function of the employee.”10 Inspired by military uniforms, the epaulets were only worn on short sleeved shirts, as long sleeved shirts were generally paired with a navy blue jacket, vest or sweater, depending on the job position. Epaulet color schemes were later simplified, and today conductors wear a silver Amtrak logo and four horizontal stripes against a navy blue background; assistant conductors wear a silver logo on blue; and Onboard Service and Station Service personnel sport a white logo on blue. Onboard and Station Services employees show off their uniforms in 2006. Amtrak continues to adjust uniform design in response to employee input, fashion trends and new developments in the textile field. In the fall of 2013, approximately 5,700 Train Service, Onboard Service and Station Service employees were provided with a copy of the new Dress For Success uniform catalogue. It highlights the wide array of components that are available to employees, including required uniforms, optional accessories and expected grooming standards. 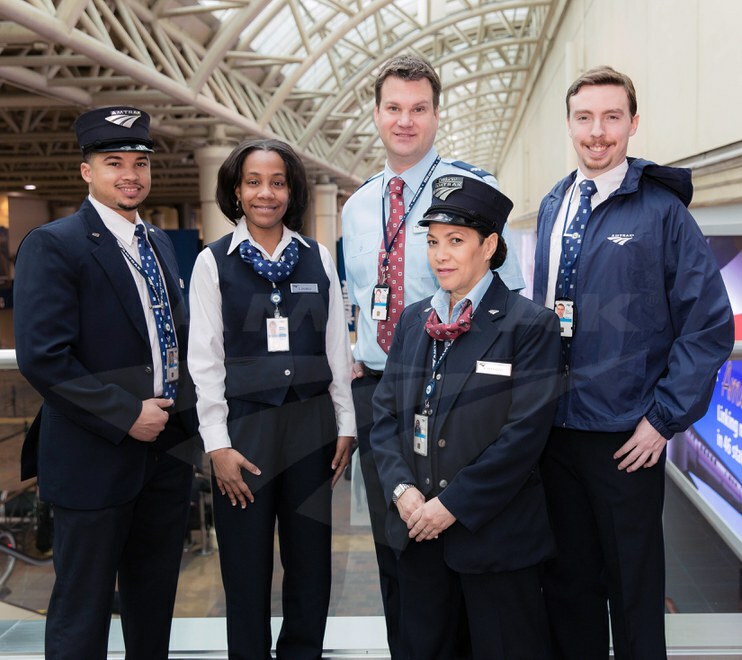 In 2014, the Amtrak Uniform Program continues to evolve with a more business-like approach. New fashion-forward neckwear with a subtle Amtrak logo has been distributed to employees. Male neckties and female ascot loops in rich burgundy or royal blue complement white or light blue dress shirts. Also, station employees at medium and small Amtrak stations across the system now have the option to wear a light blue polo shirt instead of the shirt and tie ensemble. This new, more casual look is still professional but better meets the active responsibilities for Customer Service employees. in 2014, including new burgundy and royal blue neckwear. Fashion has proven a useful tool in Amtrak’s efforts to promote passenger rail as a modern, comfortable and efficient travel mode. While based in rich railroad tradition, uniforms have always responded to the needs of current employees and their job tasks by incorporating new fabric blends and appropriate tailoring. Ultimately, though, these uniforms leave the customer with an impression of a unified, professional workforce that is ready to assist them anywhere and at any time. 1“Amtrak Designing Job Appealing,” Beaver County Times, December 17, 1971. 2“Amtrak presents a new look,” Penn Central Post, February 1972. 5“Amtrak Designing Job Appealing,” Beaver County Times, December 17, 1971. 6“Public Lives; Designer Looks Back With Pain and Pride,” The New York Times, September 11, 1998. 7“Stan Herman Takes Uniform Approach to His Designs,” Chicago Tribune, July 22, 1999. 8“Amtrak employees sport new threads,” The [Rhode Island] Hour, October 22, 1999. 9 “You wanted blue,” Amtrak Ink, January/February 2003. 10 “Traditional Uniforms to Return to NEC,” Amtrak Ink, February 2006. "New Stewards' Uniforms Feature Style And Comfort," Amtrak NEWS, June 15, 1977. 8. "On-board Attendants To Receive New Uniforms," Amtrak NEWS, July 15, 1977. 5. 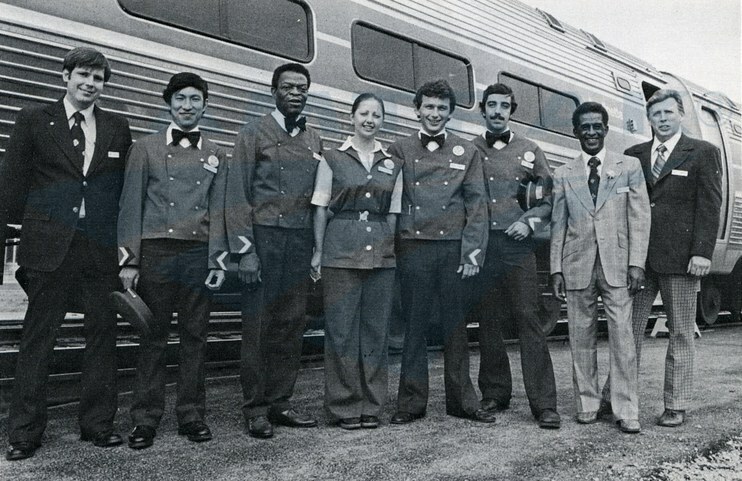 "On-Board Service Personnel Outfitted With New Uniforms," Amtrak NEWS, April 1978. 12. National Railroad Passenger Corporation (1988?). Amtrak's Pride & Professionalism: Outfitting Your Future. Washington, D.C.
----- (2006). The Uniformed Look. Washington, D.C.
----- (2013). Dress for Success. Washington, D.C.